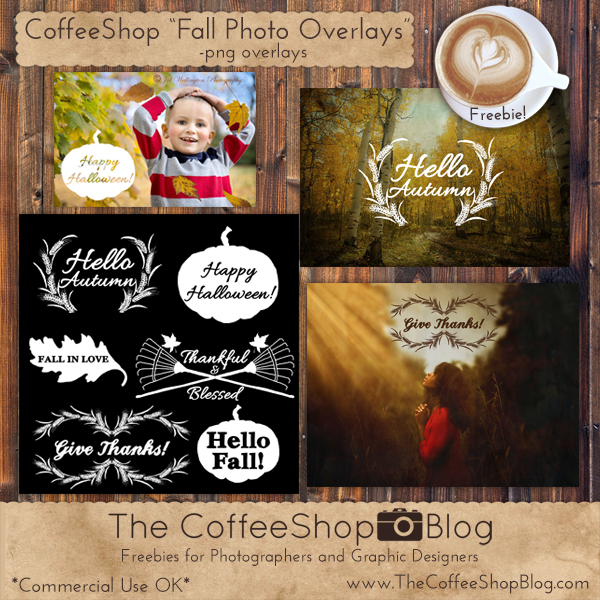 The CoffeeShop Blog: CoffeeShop "Fall Photo Text Overlays"! CoffeeShop "Fall Photo Text Overlays"! Today I have some fun fall-inspired overlays for your photos. You just drag and drop them on your image and resize to taste. You can also change the colors by grouping a color-fill adjustment layer to the overlay. I am going to have a tutorial this week on how I create these so you can design your own custom overlays. And I will also have an editing tutorial using textures. You can get all of my favorite holiday digital designs in one download for free if you purchase my action/preset or digital design pack this month! My action/preset pack includes several exclusive action sets you can't find free anywhere, so be sure to check it out. These packs support my site, so thank you for considering them!!! Original images used in this post: woman, fall forest, and boy with leaves by Jill Wellington (Etsy Shop, Facebook, Blog, YouTube Videos, Pixabay). I used some graphics from the (affiliate link) Graphics Fairy Premium Site. Download the CoffeeShop "Fall Photo Text Overlays". Sentiments/word art creations were the first things that I started designing when I first began my blog. I never thought of them as also working for photo overlays but that definitely makes them more versatile! Thanks for these! Can I just say, thank you so much for your blog!!! Your website is amazing!!! Ashley, thank you!!! If you ever have suggestions of things you would like to see me post here please leave a comment.